The Sabiales includes the Sabiaceae and the Proteaceae. Sepals, petals, and stamens are oppositely arranged each other in the Sabiaceae. 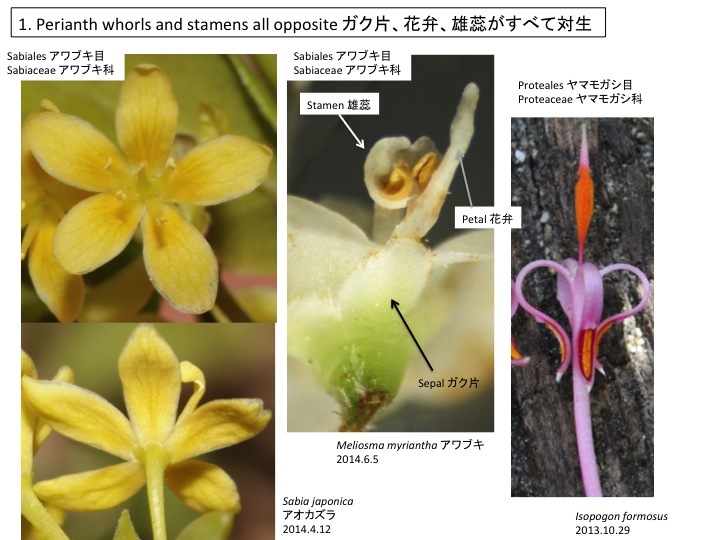 In Proteaceae, each tepal is opposite to each stamen. Most eudicots have alternative arrangement and the opposite arrangement is synapomorphic in the Sabiales and Proteales. Floral organs are spirally formed and the opposite arrangement is caused by the change of plastochron length in Meliosma in the Sabiaceae (Wanntorp and Ronse De Craene 2007). A whole structure of floral organs in eudicots is formed because the length of plastochron is shorten (Endress 2011). If we know the molecular mechanisms to regulate plastochron length, we will be able to understand how diversity of floral organ arrangement evolved. 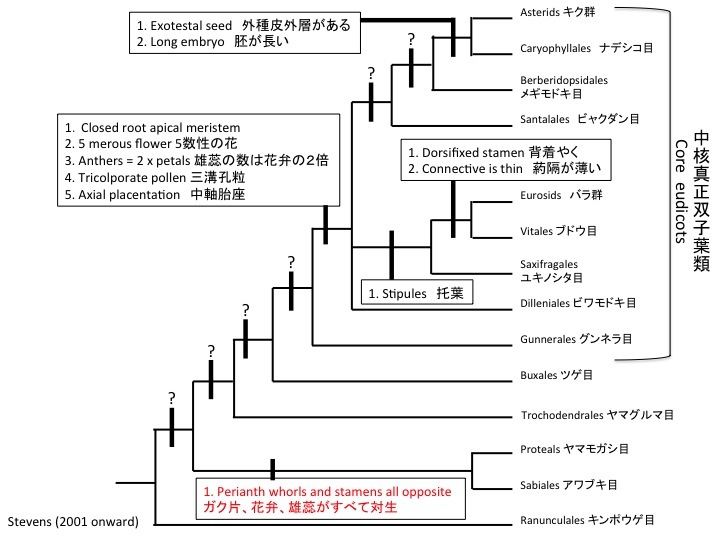 Endress (2011) Evolutionary diversification of the flowers in angiosperms. Amer. J. Bot. 98: 370-396. Wanntorp L., Ronse De Craene L.P. (2007) Flower development of Meliosma (Sabiaceae) – evidence for multiple origins of pentamery in the eudicots. Amer. J. Bot. 94: 1828–1836.